In Technical Tip 103, I began this two-part article. What follows will give you some background and if you have not read Technical Tip #103 you will find it helpful to read it before this one. Prepare the RV finish in advance of the trip: "Super" wax the body exterior, including wheel trim with a good quality wax or polish. If you are a waterless or dry wash user follow your usual procedure to thorough clean and polish your RV. On the trip, be prepared to clean the RV with water, sponge, chamois & stiff brush. This will make it easier to clean the road grime off. Check the tire dates and have them examined by a truck/RV tire professional to assess whether they are safe for the trip. If they are deemed safe, then clean them. Some use 303 Protectant or other RV tire safe cleaner/polish on the tires to provide a finish that will protect from UV and Oxidization damage and provide some surface protection from dirt. Given the distance you will cover, the tires will also provide their built in UV/Oxidization protection by moving the waxes in their construction out to the tire surface as they are used. Ensure they are at the proper pressure and that the monitoring system is functioning properly. Speeds in the north will be slower however you will be travelling on Interstate highways to get to the area. Add or ensure that the rear wheels have good "mud flaps” to direct road debris down and way from your towed vehicle. Add and Use Accessory Coach Front and Tow Vehicle Covers: Diamond Shield or other similar brands of clear plastic coating or a vinyl bra on the RV and a tow cover shield on the towed vehicle are wise improvements. Wax them prior to the trip to shed dirt easier. Our coach came from the factory with Diamond Shield protection, which we have always properly maintained, and it worked well over the trip. We elected to buy from our supplier, Coastline Mfg. Co.(https://rvandoffroad.com/), a custom fitted cover that completely protects the tow car from the top of the windshield down to the lower air dam, together with the front sides of the front fenders. They will provide access holes for your towing system which you need to specify when ordering the cover. We made this selection even though we also had access to suppliers which sell hard plastic guards and vinyl mesh shields that stop debris from coming up off the roads. The experience of others with those systems all reflected that on the 'Alaskan' trip they did not perform all that well and many said the Coastline Cover was what they would use if doing a similar trip. Some of the tour and caravan companies suggest covering the lower engine section of rear engine pusher coaches with a wire mesh to prevent rocks and stones from being thrown up into the rad or oil pan. I’ve heard of a RVer whose coach took a rock up into the side rad shroud area that bounced loose when the coach was driven over a particularly rough road long after the trip and the stone struck the fan and deflected into the radiator, causing a large coolant leak. While you can always take precautions, this is your call. Travelling at slower speeds on gravel roads is the best way to avoid stone damage, however you cannot control the actions of others. Our experience showed that small boat and utility trailers being towed behind pick up trucks and travelling too fast for conditions were the most likely to throw off a stone that will strike you. Slowing down and moving to the road edge often avoids an unpleasant experience. > Maintain the front of coach daily when on the road, if possible. Avoid fuel stop squeegee's: The soap and windshield solution with alcohol will remove or damage the wax. Most RV Parks in the North allow hand washing with brush and bucket. Some have RV & car wash pads which will allow you to spray off most of the grit and grime. 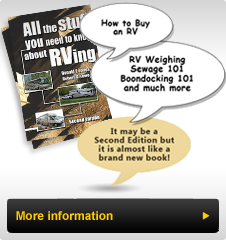 Use them, experience will show that this is a timely way to get your RV combination back to looking 'Normal'. Be careful to avoid damaging the finish, ideally you want to wet and loosen the grime before trying to remove it, otherwise you will scratch the finish. These spray systems use high pressure water and a nozzle designed to fan the spray out over a wide area. Care needs to be taken around side and rearview cameras, vinyl accent striping and any loose trim to avoid damage. These wash pads are long enough to allow a motorhome and towed vehicle or pickup with trailer (either fifth wheel or conventional) to be washed while connected. Hoses may be suspended on high arms making it easier to get around the combined unit. Others simply use long hoses and require time to get the hose from one side to the other. Having an assistant makes the task easier. The wash selections will be limited often to Wash & Rinse choices. It is rare to have the variety we are familiar with in Canada and the lower 48 States. The charge to start a typical wash is $3.00 (3 loonies in Canada or 12 quarters in the US). Experience using these indicates that a complete wash including RV Radiators, engine area, some underbody spray as well as the exterior body will run $15 to $20. Have a sufficient number of the appropriate coins ready to insert. There rarely is any warning when the wash is approaching the turn off point. Some post how long the $3.00 wash will run, but don't count on it. If it stops before the wash is completed, it will require another $3.00 to restart. A hint: If there is no time posted, insert the $3.00 charge, and begin to wash. When it stops use the beginning and stop point as a guide to how many more $3.00 washes it will take. If possible have an assistant add coins as you approach the place where the wash will end and then you may be able to top off the wash without running out prematurely. Some RV parks provide Tokens for their washes and sell them in quantities sufficient for typical wash. Should you run out you'll need to buy another 'bunch' or if you have extra they can be donated to any other RVer in the park. The primary reason for using these tokens is the reduction in keeping change in the local currency and the ability to use a credit card to pay for a wash.
Dust will enter and settle on every interior surface! Using the engine driven Air Conditioner set to the vent setting and recirculation mode to create pressure inside while driving may reduce the dust infiltration, but it won't eliminate it. Place plastic bags over direct entry places into the RV Basement, such as cord access hatches, especially if these are through the floor of storage bins. Expect dust to make it around even well-maintained cargo door seals and leave a fine dust on every surface in the basement. Covering valuable items which should not get dust on them will add some protection. /> Overall, expect the unexpected. Truckers warn that if you encounter wildlife near, or on the road, pass slowly if they are on the sides, stop and wait if they are on the roadway. DO NOT blow your horn, the animals are more likely to approach your RV after the horn blast than leave the roadway. Some of the best photos we took came in these unexpected stops. Stay in your RV and take photos through the clean windows. You will often know in advance that there is wildlife nearby because the traffic will be stopped ahead. This will likely be a line of five to ten vehicles, certainly nothing like you have experienced in the south. On our return to Tok, AK as we were leaving AK, we came over a small rise in the road that prevented us from seeing what was ahead. As we crested the small hill we saw a blackened road surface as far as we could see ahead, not directly from tar spray on the road but from the tires of vehicles that had gone through the tarred section of road. This road section just over the hill had obviously been repaired earlier in the day with gravel, sprayed with fresh tar and left exposed rather than being covered with a top coat of gravel. We crossed other sections farther down the road where the repairs were gravel covered and completed. We concluded that they had forgotten that particular (first) spot when spreading the top coat of gravel. Unfortunately, this was in an area where we did not have our Tow Car Cover in place and while the lower sections of the coach, especially behind the wheels had numerous tar spots, our white tow car was completely covered with tar from the roof, windows and all exterior surfaces down to the bottom. Given our trip timing and the fact that we were heading back onto the Alaska Highway the next day, with the tow car covered with tar, we did not want to damage the fleece lining of our cover by getting tar all over it and ruining the cover. We decided that we would travel without the cover. The good news for us was that since we were near the end of the road repair season, most sections were already repaired. Other than lots of gravel pieces found in the tray at the base of the windshield, we had no further damage. We did travel through the new sections very slowly to reduce the chances of incurring any damage. To close the loop on cleaning the tar, I had a container of Goof-Off2, an environmentally friendly citrus based cleaner often used to remove graffiti and adhesives from hard surfaces. This cleaner was sprayed on an area and allowed to soften the tar as it began to run down the surface. I used over a roll of paper towels to remove the softened tar. Amazingly the citrus based cleaner softened the tar, so I could wipe it off and did not remove the wax. Prior to settling on using this cleaner, I experimented with Goof Off (a harsh chemical-based cleaner, "the original") which did remove the wax, as well as WD40 and some odor-free mineral spirits, all of which I had with me. All of the latter chemicals removed the wax and required constant scrubbing to remove the tar. Using the Goof-Off2 took all day to clean the car however it was extremely effective and safe to use and having a waxed surface meant a lot less rubbing to get the tar off and left a waxed surface. We were able to complete the remainder of that portion of the trip with similar road work sections with the tow car cover on. At our destination where we removed the cover and washed it a few times to remove the dust and remaining grit from earlier in the trip. The cover was then able to be stored ready to use again. At the conclusion of the trip, we planned a couple of weeks of cleaning, dusting, waxing and checking over the coach at a nearby campground. Taking such a break, gives the time to return the coach to the way you like it to be. It also allows the time to thoroughly examine areas where there may have been issues. Checking the tires, undercarriage, engine and radiator areas as well as the lower storage areas allowed any issues to be identified. We had the chassis lubricated in the Yukon however after arriving home we planned our annual chassis inspection and service. This down time allowed us to clean the dust out of everywhere inside and out, to touch up stone chips and generally give the coach a thorough going over. We waxed it, decided that the tires were in need of replacement, serviced the tow bar and found little items to be attended to. Thankfully, the many improvements and enhancements we made in the year prior to the trip proved to have been worthwhile, everything performed as well or better than expected. We experienced a couple of windshield stone chips one of which was repaired in the Yukon and the other received while driving through the Prairies, was repaired after we arrived home. We did experience a water pump leak and the service experience was no more expensive than if it had been carried out Canada or the southern 48 states. Turnaround time from beginning to end was 2 days and we did not lose any time on our trip. Facilities exist that provide capable service, quality parts and because of the short season, prompt parts delivery. Coach body parts will be slower to acquire however standard parts are readily and quickly available. I hope you found these two Technical Tips helpful and should you adventure on to Alaska, the Yukon, Alberta and British Columbia, that you bring back memories and stories to share with many! Travel Safely & Enjoy! !